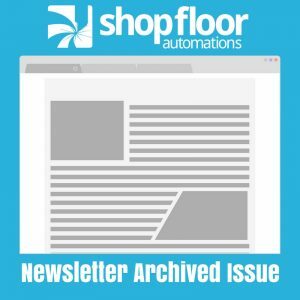 The following is an archived copy of the Shop Floor Automations Newsletter – July/August 2014 issue. We’ve added a convenient live chat feature to our website. You can now communicate with a live person instantly via chat on our site. It is found in the lower left corner. Our live chat staff can answer technical questions; provide shipment status, stock levels, and general pricing on product or services; help you navigate our website and online store; or help you consult with our sales staff. Scytec’s DataXchange has updates that add some new features based on customer feedback. The primary addition is being able to have saved charts and source connection notifications. Several other features include part numbers and counts being displayed on the real-time dashboard, filtering by shift, and having unlimited displays and reporting to clients on PCs, iPads, monitors, and more. More customers have started adding machines due to the free 2-week trial, during which the payback can be seen immediately. Leverage the power of Okuma THINC with Predator CNC Service to provide intelligent software-based machine monitoring via an Ethernet interface. Predator CNC Service supports machine operation modes, cycle counters, variables, feeds, and speeds for all makes and models of Okuma Mills and Lathes with P300, P200 and P100 CNCs. Leverage the power of Predator Machine Monitoring and Data Collection from within Okuma THINC to simplify and track CNC machining and productivity. Contact us for a free 30-day trial. Over the 16 years we have been installing DNC systems, both Ethernet and wireless, we have been asked many times if there is a way to connect our DNC systems to the RS232 port internally in the CNC control, with a hardware connection to the network, but still being able to leverage the DB25 connection on the outside of the machine. The answer is YES! We have developed a “Y” interface cable to keep the outside serial port operational to plug in a laptop or external USB Connect device and run the DNC system. If and when things fail, simply plug in the external device and the Y interface cable does it all and keeps your system up and running. Send us an email for more details.